With Samsung’s announcement that Galaxy S II owners will not in fact be getting their Ice Cream Sandwich updates today as previously stated by one of their websites, the age-old discussion regarding Android updates, skinning and fragmentation has returned to the fore. Android 4.0, codenamed Ice Cream Sandwich and referred to as ICS, was confirmed on way back on October 15th of last year, the same day that this very website launched, yet now, almost 5 months later, only a small handful of devices from major manufacturers have either launched with or been updated to Google’s latest and greatest operating system. Why is this the case, and what can be done to help the situation? Take a look at this graphic, taken from the Android website, which shows the versions of Android which have accessed the Android Market Google Play in the two weeks leading up to March 5th. 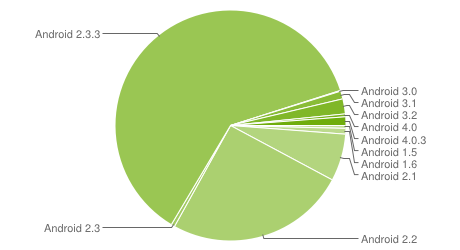 Just 1.6% of Android devices are running the latest version of the software. A comprehensive list of devices that have either shipped with or been officially updated to Ice Cream Sandwich is below. Please note that this does not include devices that have been announced but not shipped. Back on the day that Ice Cream Sandwich was announced, Google’s Matias Duarte said that any device that could run Gingerbread was theoretically capable of running Ice Cream Sandwich. That was 5 months ago, and we have 8 devices that run it. This is not good enough. Firstly, some of the blame has to be placed on Google. The OEMs do not get access to the source code until it is publicly released, with the exemption of the partner making the flagship Nexus device, such as Samsung’s Galaxy Nexus, announced alongside Ice Cream Sandwich at a press conference in Hong Kong last year. While Google should want the Nexus phones to succeed and have an advantage over other handsets on the market at the time of release, I believe that major manufacturers such as HTC, Sony, Samsung and Google’s own subsidiary Motorola should get early access to the source code, so that handsets and devices can get the latest software promptly after it is unleashed upon the world. It is wrong to go into a store at this stage and see just one device, the Galaxy Nexus, sporting up-to-date software. We must never forget the manufacturers themselves, as they too delay updates for a number of reasons. Firstly, they already have your money and, as such, there is little benefit to them if they spend time and money preparing software updates for phones. This raises a whole load of questions regarding the state of customer service in the 21st century, but those are for another day. An example of this kind of neglect is Samsung, with the Galaxy S. Late last year, the Korean company confirmed that they would not update the phone, the second biggest selling Android device of all time, to Ice Cream Sandwich. Their excuse? TouchWiz and Ice Cream Sandwich can’t live together on the ROM. Why not just get rid of the crappy skin which users hate? Of course, manufacturers feel that they have to stick their bloated skins on top of Android, and updates get delayed to ensure that this is the case. Take LG for example. At Mobile World Congress 2 weeks ago, they unveiled a host of new Android devices – the Optimus L3, Optimus L5, Optimus L7, Optimus 3D Max, Optimus 4X HD and the Optimus Vu phablet. Of these, half are scheduled to launch with Gingerbread, and only the L7, L5 and 4X HD are guaranteed to have Ice Cream Sandwich. As for the rest, LG issued a vague timeframe for updates of later this year. Considering that they have no plans to update their existing phones until Q2 or even Q3 at the earliest, I wouldn’t hold out much hope of this ever happening. If such an update actually does come, the community will probably have Jelly Bean stable on the handsets. LG’s excuse? A combination of the skin and the fact that they seemingly don’t care about consumers – a statement that can be applied to almost all Android manufacturers. 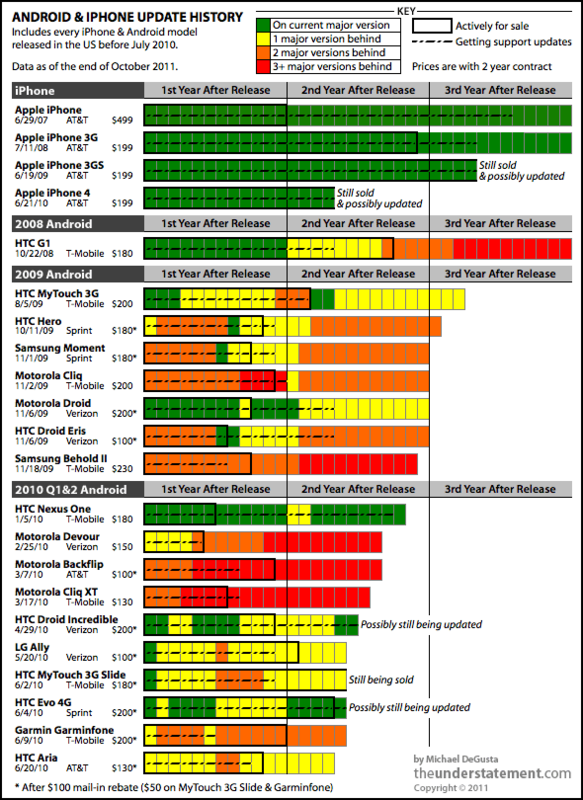 This infographic, made last year by Michael DeGusta of The Understatement, shows just how slow these updates can be, especially compared to iOS. Across the internet, I have seen people complaining about the update situation, only to be told to buy a Nexus phone and have all their problems solved, but this argument is ridiculously stupid. The beauty of Android is the wide variety of handsets, tailored to suit every need. To be told that, in order to be certain to get the latest software officially, you have to buy a certain device, takes away this beauty. If I wanted that kind of situation, where I no choice in form factor in exchange for a guarantee to get updates, I’d buy an iPhone. Take the Galaxy Nexus, for instance. At 4.65″, it is way too big for me. I think the design is horrible in comparison to some other smartphones, the rear camera is, for such a high-end device, sub-par for the course, and Samsung’s incessant use of flimsy plastics mean that I would never even consider buying one. If I want to get an Android phone with almost a guarantee of an update however, I have no other choice. This is not on. Even if I were to jump on the Nexus bandwagon, I still wouldn’t be 100% certain of updates. Certain Nexus S owners are still waiting for Google and carriers to push the ICS update to their devices, even though most GSM variants of the phone got the update to 4.0 back in December. We must not forget the Nexus One either. The HTC device was Google’s first flagship and, despite the fact that the Android community can do it, Google has announced that they do not plan to push an ICS update to the handset which is still less than 2 years old. So, until the day comes where updates are prompt and ensured, I will not buy an Android phone or tablet. I know that there are other ways of getting updates, but manufacturers and carriers should have a duty to ensure that devices are kept up-to-date for at least the standard contract length of 24 months. And finally, before you dismiss this whole post as pure trolling of Android, I am an Android user and I am still waiting for Gingerbread. If HTC doesn’t care about an 18 month old phone, why should I?